You can use this code if you want to create a store locator. Why this is useful? Imagine if you have several addresses on your database, you will never want to manually pin point the latitude and longitude of each of those addresses. That's why we have the geocoding method. Just input the addresses and Google will try to identify the approximate location of that address. Step 1: Basic HTML code. Step 2: Create form inside the body tag. Step 3: Put some example addresses before the form. Step 4: Create the PHP geocode() function. Step 5: The code when the user submitted the form. Create index.php file and place the following code. Place the following code after the previous step's code. Get your Google Maps Geocoding API key here. Replace YOUR_API_KEY with your Google Maps Geocoding API key. DO NOT restrict your API key so that it will work. Place the code below after the body tag. Replace YOUR_API_KEY with your Google Maps API Key. Make sure you restrict your API key to be used on your domain only. Use the Google API dashboard here. Working with Geolocation watchPosition() API - In this post, I share a working navigator.geolocation.watchPosition() code I used when I wanted the user to know his current location in real time (while he is walking or riding a vehicle). 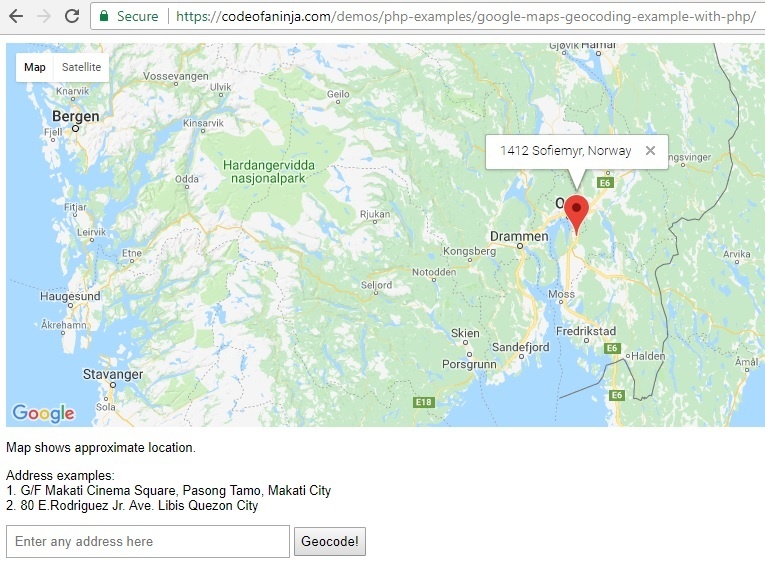 Thanks for reading this Google Maps Geocoding Example with PHP! I am having a go at doing this one, I love your site by the way it’s a fantastic way to flesh out ideas :D LOVE IT! Just saw this comment @disqus_Tkg3Hukomt:disqus, thanks for complimenting our site! hello.Thk’s for this Code. I’m trying to integrate it in my own site but I got an error with function file_get_contents. My script can’t open the link but when i put the link in my browser i have the result in json format. Good to hear it’s fixed now @disqus_DNUPio9HWu:disqus! hello ninja, i tried this tutorial, when i write a location, i got no errors, but the map does not show up..
recently i am trying many tutorials but almost non of them works !! plesase need a help ! Is there a solution for the issue stated by Marwa_97? Even I am facing the same issue and not sure how to fix. Can someone help? @marwa_97:disqus @savithabijoy:disqus what location did you try to input? I’ll have to test it, thanks! Hello @fabiofronda:disqus, thanks for the tip, code updated now! i used above code for finding city but there is some error occur in geocode(). so anyone help me how to solve this error and i get proper output. Hello @viralsampat:disqus, what exactly is the error message you see? having rare situation. Two sites a same hosting provider. At one your script works fine, at the other it doenst. Any idea? @Nancy, would you give us your test URLs so we can investigate on the issue more? Sorry for the late reply, I just saw this comment. Is there a way i can modify the above code to work with mysql database? Hello @asmamefoued:disqus, I’m glad you found it very useful! Hello @Tom, thanks for this tip, we will look into it and update the code. Thanks so much, worked like a charm for storing Unknown Lat and Lon in database. Saved me lots of time, I’m sure! Hello @rohatashrawar:disqus thanks for visiting our site! Glad it works fine for you! For those who has the same question, the answer is: Because it works for this example. But its best to use a key to prevent errors in the future. At the moment, it looks like Google is not very strict when you use their API small number of requests. But if your app makes large number of requests and they detected it, I believe they will require you to use a key or pay for the requests exceeding the free tier. Hello @scottdeluzio:disqus, thanks for this tip, your statement is true. I just updated the post! This is a great tutorial and works for zip codes (which is what I need). Is there any way to capture the town or city name so that I can output it back to the user in a paragraph of text? Hello @ninjazhai:disqus In my source code I get an error ” unexpected token ?” at this line “center: new google.maps.LatLng(” Would this have anything to do with the init_map functions or variables? Thanks in advance. You’re welcome, glad it works for you @disqus_AhliCF4f7a:disqus! but it’s not take session id, session name, session email of facebook. why. @disqus_AhliCF4f7a:disqus what are you trying to accomplish? Would you tell us any error message you see? but i want that google map will show whole path between 2 locations. so plz tell me the code. Hello @disqus_AhliCF4f7a:disqus, thanks for the new post idea, we will add it in our to-do list. How are you setting and passing the API Key for the Maps API? Hello @disqus_t3KF6qireI:disqus, we do not use any API key in the script above. very good Tutorial, and it did help me a lot, but google json api need KEY and if you dont use it, it will not process the request. Hello @Re, glad to help you! Yes you might need a key in your case, but our code above works without a key. See the live demo. Yes I saw it, thanks for linking your project to here! Love this code, been looking for something similar since a while ago. Works perfectly. Was quite bamboozled with the enormous amount of documentation in the google developers page. Slight query, any idea how to actually store this location in a database and then display the same to someone else when they open the map? Similar to a tracking app where you can track somebody’s location. Those tutorials does not use the same data set, but it should give you a start. Hello @chris_kwan:disqus , yes there are cases that we need to add an API key. We’ll have to make use of https://console.developers.google.com/. Would you tell us what you see in the console? Did you try to add your API key like the following? yes that was from google example, but I got this response “js? yes I did, but still the map does not show up and there is error (test_c.php:32 Uncaught ReferenceError: google is not defined) ? It looks like an error in your PHP script? Do you see this in the console? yes, I am doing it differently by querying a database and extracting data out to be process instead of posting it like in your case. Try to run without your database first. If it worked, it means your PHP script has the problem, not our script above. yes will do thanks again. Hi @KenPachi, would you try to right click your page > click inspect element > click ‘console’ tab and tell us what exactly is the error message? Better if you will send your test link so we can investigate more about the issue. Thanks. Thanks for this suggestion, we’ll add this code in the future! map is not being displayed…what do i do? Hi @Disha, what was the error message you see in your console? thank you for this great website and especially Google Maps Tutorial here. I dont understand why, but I do have problems to get it working though. Where do I include the geocode-function? If that worked, it means you did not supply the correct address. 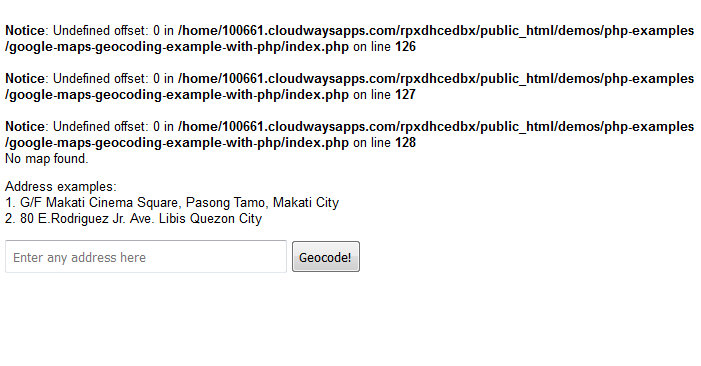 Hi @nuramirahroslan:disqus , please make sure the geocode() function is in your php file. hi sir! nice code, but where i must put the php geocode function()..?? It is in the step 4 above. In complete source code, do I have the complete package, I mean 3,4 files and my own geo-location API key will work? Hi @qadeerakhtar:disqus, you will have all the files used to make our demo above work. Your own API key will work as well. Hi @jasontaii:disqus, are you sure you added the code on step 4 above? If so, would you show us your full code? I got the system working fine, but now it is complaining that quota has been exceeded. Not sure whose key it is using. When I then try to use https:// and &key=MY-KEY, it responds nothing. Hi @Jukka, you need to restrict the key to be used with your domain only. There’s an option in the Google console to set that restriction. You may look into it, maybe it is to prevent “spam”? Hi @tbschen:disqus, I’m unable to replicate the issue. Would you try again? Please send a screenshot of the error as well. Thank you! It probably has to do with you not using an API key? Google does allow a couple of requests without a key, but not all and if it blocks your request, the expected array with longitude and latitude are not generated. I’m unable to replicate the issue, would you try to hard refresh the page? 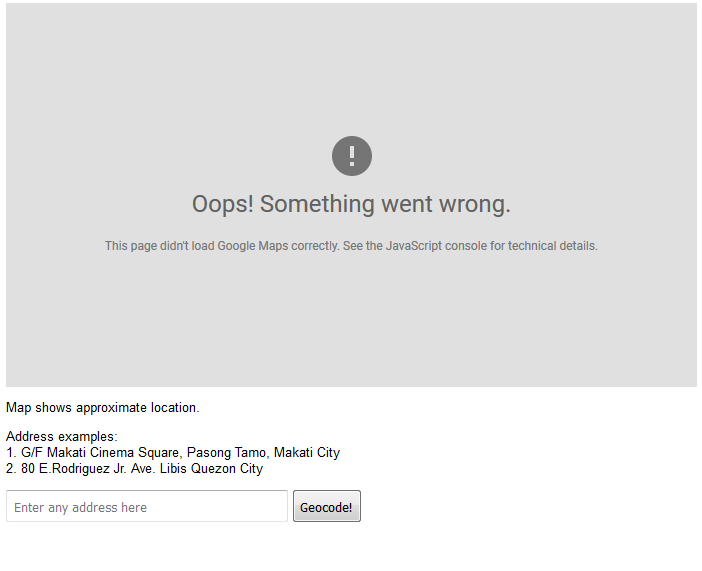 I can’t get Google Geocode to work at all. It use to work just fine. I used it on my site several years ago. Was trying to get the function operational again but my code fails. It doesn’t even return why. The main get functions just returns false. So I’m wondering what has changed about Google Geocode service. The only difference between your code and mine is that you are using $resp_json = file_get_contents($url); whereas I am using simplexml_load_file($url). But that is just personal preference. Tried using file_file_contents and got the same results. It just returns false not matter what you do. Here is what I do…This use to work just fine. This function only returns boolean false. Does not work in production. This turned out to be a weird problem that took me hours to troubleshoot. Everything worked just fine months ago. Once we discovered it worked on the server but not when accessed by a remote browser was when we realized it was weird. Digging deep we discovered that it was actually shooting an error instead of returning false. The fix was upgrading to a newer version of PHP which of course made other stuff not work properly. How this is even possible I still don’t know as I have moved on. I hope you people know that the random things you do to make things better translates to endless hours of rework for people like me that have deadlines to meet and paying customers to please. @disqus_TjtVilhOXM:disqus, in your case, it sounds like you are using our simple example above on your big production application. It is not recommended. I don’t know the exact date and time of Google Maps API updates. I don’t know when or how to update my tutorial above immediately as well. In your case, you must go directly to the official Google maps docs where you can always find the most updated and detailed information about how to use the Google maps API. 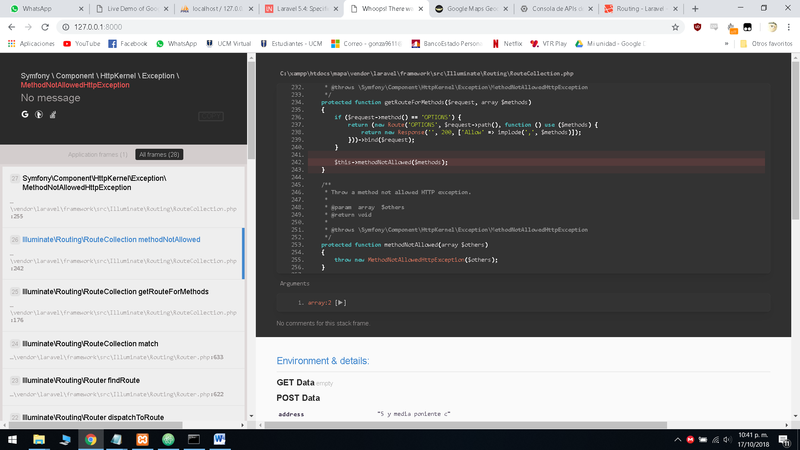 Hey i just have a problem, the code works fine and it doesn’t show any errors, but the map doesn’t show up, am working on localhost, so may that be the issue? Hi @alvaro_da_costa:disqus, yes, you should try to upload the code on a web server where it can be accessed online. Glad you made it work @alvaro_da_costa:disqus, but would you tell us how did you fix it? Hi @glennjamero:disqus, I’m unable to replicate the issue on our live demo. Did you check the error message in your console? 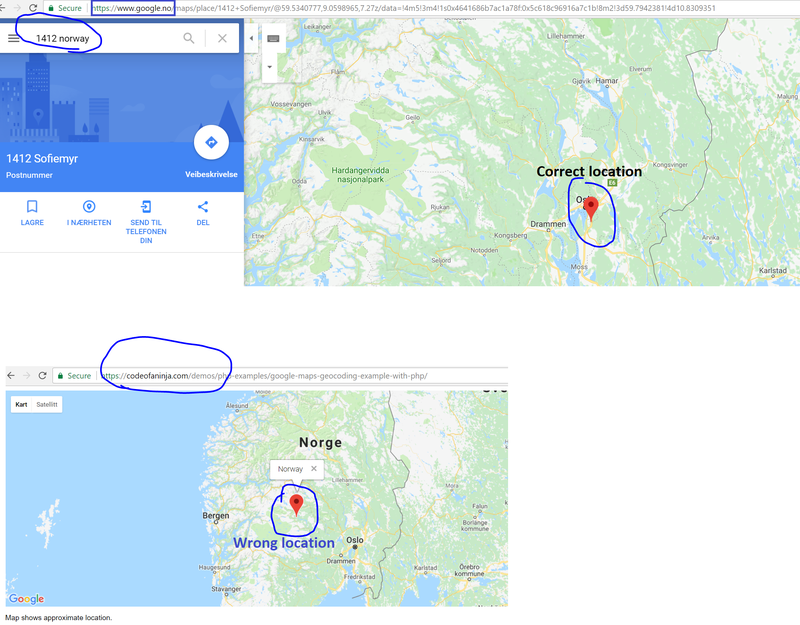 Location returned by this demo is wrong for search keyword “1412 norway” , compared to similar search on google maps. 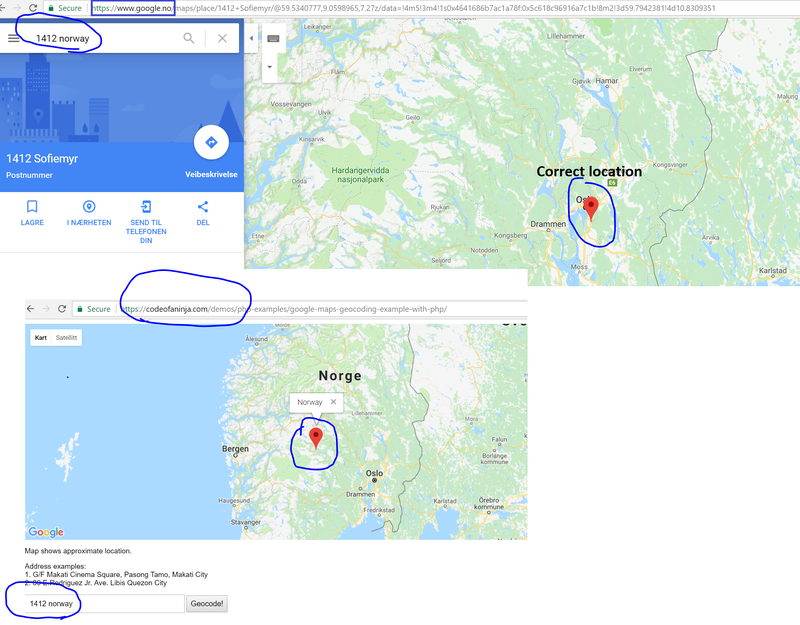 Same Google maps api URL returns two different location coordinates when called by code vs when entered in browser url field. Hi @alimohammadfawzi:disqus, I’m unable to replicate the issue. Please see attached screenshot. Live demo here returns wrong location for “1412 norway” compared to google map search. Do you reason for that? Hi @alimohammadfawzi:disqus, I replied to your other comment. I can’t think of a reason why exactly you’re having this issue. But I read somewhere before that Google maps shows a map depending on your location. For example, when you’re in Country_1 and you view your Country_1 on Google maps, your country is bigger of have better borders. But you’re in Country_2 and your view your Country_1, Country_2 will have the favor. I’m not sure, I’m just thinking out loud. Just wanted to start by saying thanks for the great tutorial. I ran into the same problem as @disqus_TjtVilhOXM:disqus where file_get_contents returned false. It didn’t matter if I used json or xml. Instead I ended up using curl to get the results needed I’m sure it’s some crazy server setting someplace but I’m currently limited on time to find the real issue. Just wanted to throw it out my quick fix in case it helps anyone else. Thanks for sharing your solution @Jon! Hi @disqus_K2pLw0Bldu:disqus, would you tell me the error message you saw in your console? Let us know of your test link as well so we can take a look. Hi @disqus_K2pLw0Bldu:disqus, please make sure you set up your API key properly on your Google console. Enable the needed API in your API library. You’re welcome @rakadevelop:disqus! I’m glad to know our tutorial helped solve a problem you encountered. Hi @chris_wickell:disqus, thanks for the catch. I just added it in the tutorial above. Hi @munsen_tidoco:disqus, if you don’t need the map, you may modify the geocode() function and return the $resp variable. It should contain a JSON result. I can not. It tells me that restrictions do not allow it. I have the key restricted to work only in my domain. If you are so kind as to put the code as you say, for if this works and I was wrong in something. The only thing I hope you do is to convert addresses to coordinates and another to do them the other way around, from coordinates to addresses. I disabled the restrictions for that key and they work, but I re-enabled them because it scares me to get a millionaire bill. So, if you can give me the example, I’ll thank you. @munsen_tidoco:disqus, unfortunately, your requirement is not part of our tutorial above. You need to tweak it according to your needs. Removing the map should be easy. Also, when you change the restriction, you need at least 15 min for this to take effect. Maybe it has something to do with the way I put the function. Hi @gonzata1996:disqus, I don’t know yet how to use it with Laravel. I won’t be very helpful with your case, sorry.